For those interested in learning to design your own car online, we have gathered some information in regards to computer aided drafting and design that you may find interesting, and hopefully useful. When building our list of car design software, we noticed that quite a lot of websites are geared towards providing a car design game online. While I'm sure this is quite interesting to those looking to design your own custom car online strictly for entertainment purposes, we hope to provide those of you who are looking for a way to utilize car design programs, in a professional manner, resources to design your car. Whether you want to become a professional car designer, or a do-it-yourselfer looking to customize a vehicle, we hope that this information will become a useful tool to you. We have been in the computer aided drafting and design business since 1995 and have utilized CAD design products from mostly the Autodesk software family (AutoCAD). While we do lean towards Autodesk products for the majority of the work that we produce for architects and engineers, we realize that there are many other great CAD design software programs to help you design your own car. Unfortunately, we have not come across many computer assisted drafting programs that can help you design your own car ONLINE, in a professional manner that is. If you know of any good online automobile design programs, please let us know by contacting us. With that said we have compiled a list of free, trial and fully paid car design software programs that you can download to your computer and create custom car designs. Please note that we are not affiliated with any of the following car design programs below, nor do we endorse any particular CAD vendor. If you are interested in designing cars for a living, we suggest you look into information about becoming a car designer to get the credentials you need to become a full-time professional car designer. Free CAD Design Programs - The first place we suggest you look for software to assist you with creating car designs, is to check out our complete list of free computer aided design programs. Many of these CAD programs have exceptional 3D capabilities and can be used to create custom cars, trucks, vans, and more. Be sure to read the software reviews at the bottom of the page. If you have used any of the free CADD software to create your auto designs, please leave a comment in the review section to help others. Free AutoCAD Download - Our preferred 2D and 3D CAD program. You can download a 30 day trial and see if it's right for you. You may also be interested in checking out some AutoCAD tutorials to help get you started. Use Google Sketchup to Design Your Own Car Online - This is a fantastic, and absolutely free, CAD program that can be used for creating 3D drawings, including car body design. 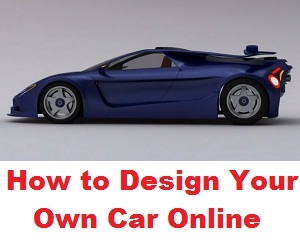 Just check out the videos below and decide for yourself just how useful this free program can be to design your own custom car. If anyone is to come out with a good software program to design your own car online, we think it would be Google. Here are some links to other Sketchup car designs created by other users that you may find helpful. Free Autodesk Software Downloads - Get the trial versions of many Autodesk software products. Several are specific to industrial and automotive design so be sure to look over the complete list. Also, be sure to visit the "All Product Trials" on the right hand side of the page and check out the "Autodesk Alias" design product downloads.